Inspiration board and montage of amber/gold/deep red colors I want in my late summer and fall garden. 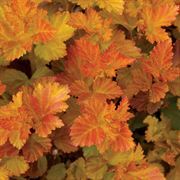 Scalloped foliage of Ninebark 'Amber Jubilee'. I am simultaneously personalizing my garden in three ways (I wrote a post about asking yourself the right questions in creating your own garden spaces here.. CREATING A GARDEN FROM SCRATCH). Here are some personal objectives I had in mind. #1 Garden drama, in both bloom and foliage, that takes place largely in the seasons when my family enjoys and uses the garden most. In our case, spring and fall. I replaced a fussy and prickly 'New Dawn' rose, that would spit out a few blooms in the dead of summer, all of which would promptly succumb to intense heat and lack of rain....with a more rugged shrub whose emerging foliage will be in a vibrant rich palette of gold, russet and umber.....more effectively matching my late summer, early fall aesthetic of deep, warm and glowing hues. My inspiration board (including the unbelievable Strawberry Moon of June 2016 that this year coincided with the summer solstice) influenced the selection. #2 Labor intensive, high maintenance plant material that only looks good for a brief period of time will be replaced with more stalwart, easy care shrubs that look handsome year round with a lot less effort. I am intent on enjoying and admiring the garden more, and working in it less. The garden has catalyzed many other interests...photography, cooking, writing, blogging.....that I now want and need to make time to pursue...an objective high on my personal garden priority list. This ninebark, a plant variety that heretofore, I have not been all that enamored with, will fit the bill nicely. 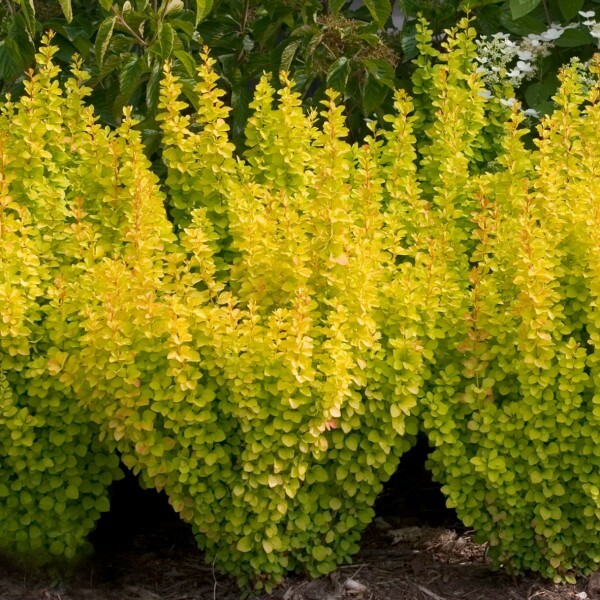 Go to this University of Vermont web page here to learn more about this rugged plant and the many other types and color choices available. #3 Interesting and uniquely colored foliage is increasingly taking up more space in my vases and in my cut flower arrangements. I ALWAYS have cut flowers of some sort in my home. All over my home. In fact, I am more likely to have cut flowers on my kitchen table than food in my refrigerator, much to the chagrin of my menfolk. And while I can always go to my florist or Whole Foods, or local farm stand to find fresh cut blossoms when there is a dearth of them in my garden.......I CAN'T always find distinctive leafy foliage, stems and berries as filler to achieve the desired effect I am after. And if you are wondering if I also planted the glowing Golden Pillar Barberry pictured above to augment my interior and exterior garden vignettes, you would be correct. Find it from Nature Hills Nursery Here . I think this one plant really served its purpose, don't you?